The French for stumble is the regular ER verb trébucher. ... under the TREE, BUSH stumbles ... that is, George Bush. - trébucher sur: to stumble on, over. - trébucher sur un mot: to stumble over a word. - trébucher contre: to stumble against. - faire un faux pas: to trip (somebody) up (generally). 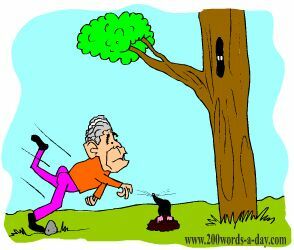 But: faire un croche-pied à: to trip someone up with your foot. Don't stumble over French words any more - learn and remember them with learning techniques like Cartoon Memory Triggers. When you need to remember a word, just think of the pic! ... that is, George Bush ... stumbles! ✔ Trébucher is a regular ER verb. There are over 5,000 ER verbs these being the most common verbs in French. ✔ Learn trébucher and it will reinforce the pattern for ALL those other ER verbs. ✔ You can more easily remember words and verbs like the French verb trébucher - French for tumble - using the techniques of the world's Memory Masters. 200 Words a Day! Free Daily French Lesson Online - the verb in French for stumble is trébucher - fully conjugated. French Learning Made Fun and Fast with your free Daily French Verb Lesson - trébucher.